Since it opening day Moscone West at 4th and Howard has been adorned by a large black rectangle on the side of the building. Careful observers might notice that this rectangle is attached to a somewhat rusty track that goes around the entire building. Soon, this rectangle will be removed. When the building was first proposed in the early 2000s art firm Diller and Scofidio (now Diller Scofidio + Renfro) was hired to develop a public art element. And design they did. Their piece is called Facsimile. It was intended to show images of inside the conference center intermixed with playful videos of life in the surrounding hotels as the screen moved back and forth across the track. While it’s certainly an interesting design, that design never quite translated to the real world. Despite spending hours scouring the internet for evidence of the piece working as intended, I was only able to find conceptual renderings of what the piece was intended to look like. In practice, on the rare occasions it was switched on the screen didn’t move and only displayed occasional flashes of light. SF Arts Commission voted to remove Facsimile on September 8th partly due to ongoing maintenance costs associated with preserving the non-functioning art. But if the Bay Area can’t get a piece of technology to work, it’s probably broken beyond repair. 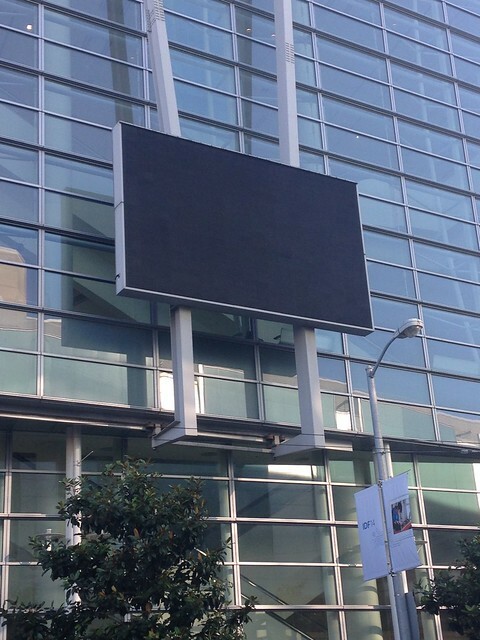 UPDATE: Walked by Moscone West the other day, and it appears they finally got around to removing the black rectangle.